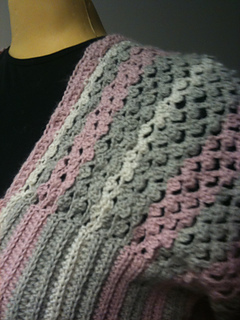 The Modular Crochet technique was applied for this pullover which is composed of rectangles joined together to create a garment. See Modular Crochet: A revolutionary New Method for Creating Custom Design Pullovers, 1976 by Judith Copeland. This bookis out of print but I purchased my copy from Ebay. 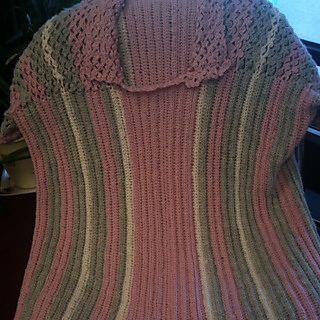 I used the picot trellis stitch for the shoulders and half double crochet for the body. The picot trellis stitch can be found in the Harmony Guides, 300 Crochet Stitches Vol. 6.